. Depending on the day, I attend a variety of meetings with engineers, user experience researchers, designers and other product managers. I spend time between meetings developing my product designs, refining mocks and hanging out with my team. One of the many highlights of my day is between noon and 1pm, when I rush up to the 27th floor for lunch at Yedo Cafe; what could be better than all-you-can-eat free Japanese food? Recently, I attended the annual Tokyo product management (PM) off-site and enjoyed a few days in the mountains with the other Tokyo APM and PM interns in Hakone, Kanagawa. The first day started out a little hectic as we all got lost trying to navigate through thousands of people to find each other in Shinjuku Station, the world’s largest train station. Luckily some of us had Latitude activated on our mobile devices and were able to meet up on the platform seconds before the train left the station. After the three hour journey, we arrived at Gora station where we continued on the adventure. We enjoyed traditional Japanese food, visited Hakone’s famous onsen, took a ropeway ride through Owakudani geysers and went row-boating on Lake Ashi. Not only was it my first time sightseeing in Kanagawa, it was a fun opportunity to hang out, relax and get to know the other PM and APMs outside of the office. Internet and current technologies. Japan was leg one for the APMs who were on a 16-day visit through Tokyo, Shanghai, Hyderabad and Nairobi. It was great to meet APMs from other offices including Mountain View, Sydney, New York and Zurich and I got to put a face to some of the people I had been exchanging emails with over the past month. Talking and exchanging insights with the APMs has made me even more pumped about my internship and the APM program. Outside of work, I continue to take as much time as possible to explore life in Tokyo. 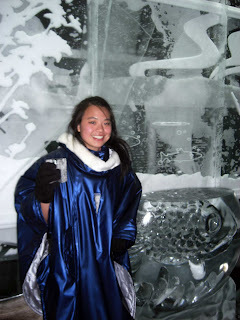 One of my particularly favorite highlights was discovering an Icebar in Ginza just 10 minutes away from my apartment. The Icebar is exactly like it sounds. From the cups to the tables to the seats, everything is made of ice! Each customer is required to wear a large hooded furry parka and a pair of gloves to prevent hypothermia. The Icebar is made by the Ice Hotel in Sweden and is definitely just one of the many crazy things you can find in Tokyo. Fun Google Fact: The Tokyo office was Google’s first international office. Originally, it was primarily for sales but since 2001, the office has grown to include engineers and PMs. Walking around the office today, you would have no idea that such a large office had started out so small! As month two of my internship kicks off, I’ve settled into my daily routine—or as close to a daily routine as an associate product management (APM) intern can have. After arriving at the office, I enjoy my definitely needed cup(s) of coffee and yogurt with granola. Lucky for me, I have one of the closest desks to the fully-stocked microkitchen. The day starts off with catching up on email, which usually piles up over night because I work with global Googlers, including many across the Pacific at our Mountain View headquarters. Depending on the day, I attend a variety of meetings with engineers, user experience researchers, designers and other product managers. I spend time between meetings developing my product designs, refining mocks and hanging out with my team. One of the many highlights of my day is between noon and 1pm, when I rush up to the 27th floor for lunch at Yedo Cafe; what could be better than all-you-can-eat free Japanese food? how you applied for the internship in Google. Please provide me every required information to my mail id. What did you study/what work experience do you have that enabled you to apply for this internship position?